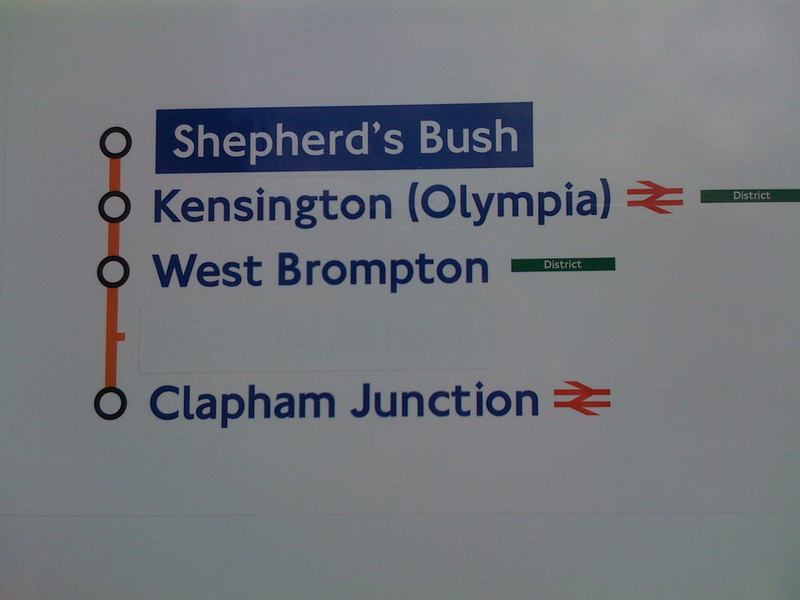 – Shepherd’s Bush (Central Line) – The Central line station reopened on 5th October 2008. The station sports a large modern ticket hall with replacement escalators. The station itself has been given a total refurbishment with white and blue tiling throughout. At the time of opening, the trackside walls were yet to be painted. Lifts have been promised at some point in the future. Watch this space! – Wood Lane and Shepherd’s Bush Market – Wood Lane station on the Hammersmith & City line officially opened on 12th October 2008 being the last station in the area to open for Westfield, the newest shopping centre in London. The station is the first in over 70 years to open on an existing line. Wood Lane station is a 200m walk from White City station on the Central line. 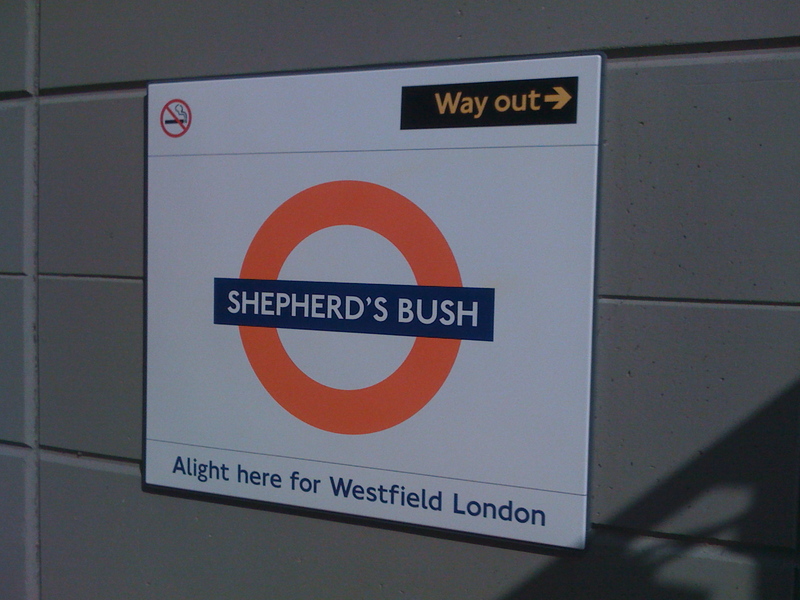 Shepherd’s Bush (Hammersmith & City) station was officially renamed Shepherd’s Bush Market. – London Overground works – Works are progressing well on London Overground with the reopening of the Gospel Oak to Barking Line on 30th September 2008. Willesden Junction to Gospel Oak via West Hampstead remains closed until mid-November for the rebuilding of the Hampstead Heath tunnel. – Acton Town – Refurbishment works have been taking place over the last few weekends at Acton Town. But the works are nearly complete with brand new signage plus the installation of new lifts making the station fully accessible. – Other Tube station refurbishment works – There are several refurbishment works ongoing during this month including St. Paul’s, Edgware, Hounslow West, Osterley, Queensbury and Canons Park. I will be letting you know the progress of these works in the forthcoming On the Network entries. That’s your round up of the projects happening this month. Check out more On the Network next month! Imperial Wharf?? Not on my map! Even with the actual line diagram covered up with this temporary one, you can see a missing gap between West Brompton and Clapham Junction…underneath that is Imperial Wharf! So yes, it will eventually appear on the maps…but not for now! 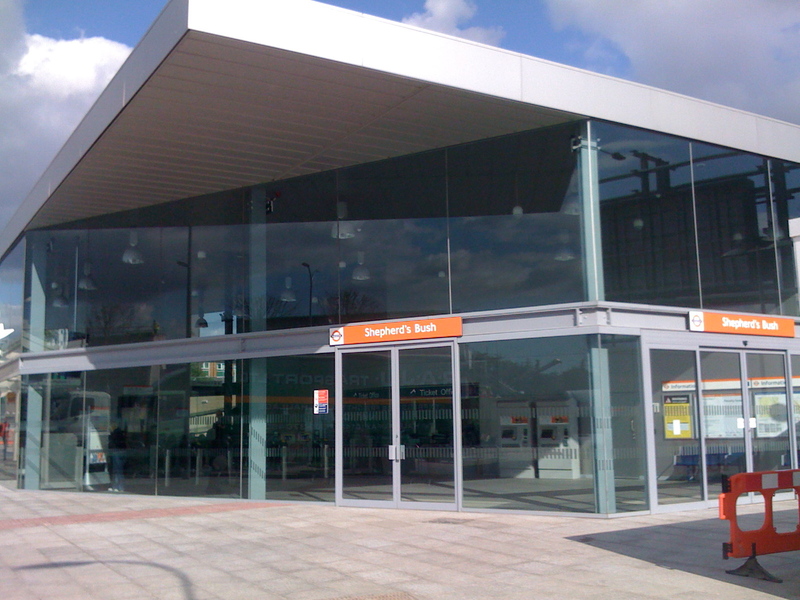 Shepherd’s Bush Overground is now open! What are my thoughts of the new station? I think it looks very well built and very clean (well at the time I was there anyway!). Very spacious and complete step free access from the station entrance, ticket hall, right to the station platforms. A very exciting addition to what is becoming a growing area of West London! If you haven’t visited the station, do have a look! In addition, some of you may have noticed on maps online at the TfL website that does not show the new timetable with times of trains serving Shepherd’s Bush Overground. 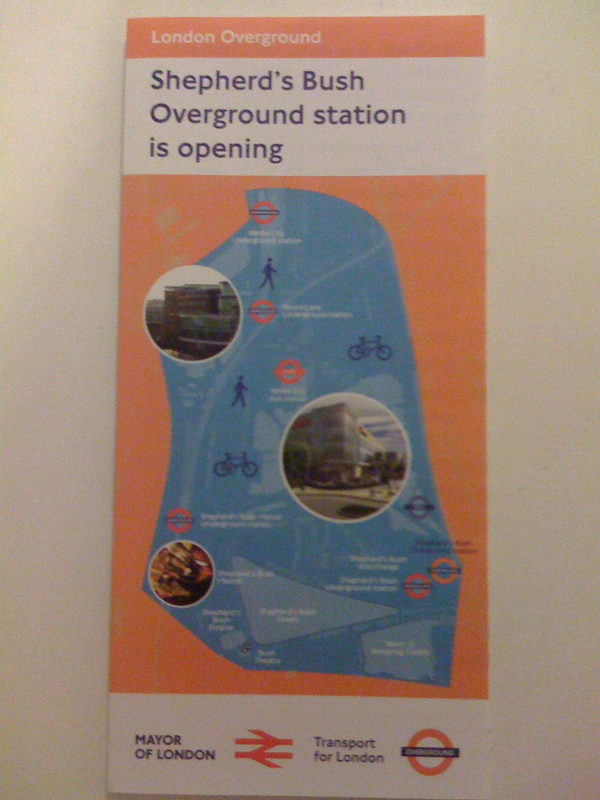 I picked up the following leaflet from Shepherd’s Bush Overground which has the new timetable! – London Overground closures – As many of you know, this month saw parts of the London Overground network closed for engineering work from 1st September. In summary, there is no service on the Gospel Oak to Barking line and no service on the North London line between Willesden Junction and Gospel Oak via West Hampstead. The Watford Junction to Euston service has been altered such that on Mondays to Saturdays, the Watford Junction trains will divert via the Primrose Hill junction to meet Camden Road to Stratford rather than go to Euston, while on Sundays, a normal service will run (although Willesden Junction to Stratford trains will run). All other Overground services will run as normal. – Shepherd’s Bush (Overground) – According to weekend closure posters, Shepherd’s Bush Overground will be opening on 28th September. I will be checking out this nearer the time, but it will be exciting indeed! – Shepherd’s Bush (Central line) – The station building is looking good and it is set to be on target to open next month. I will be taking photos of the latest progress very soon, so check the Blog for more info! 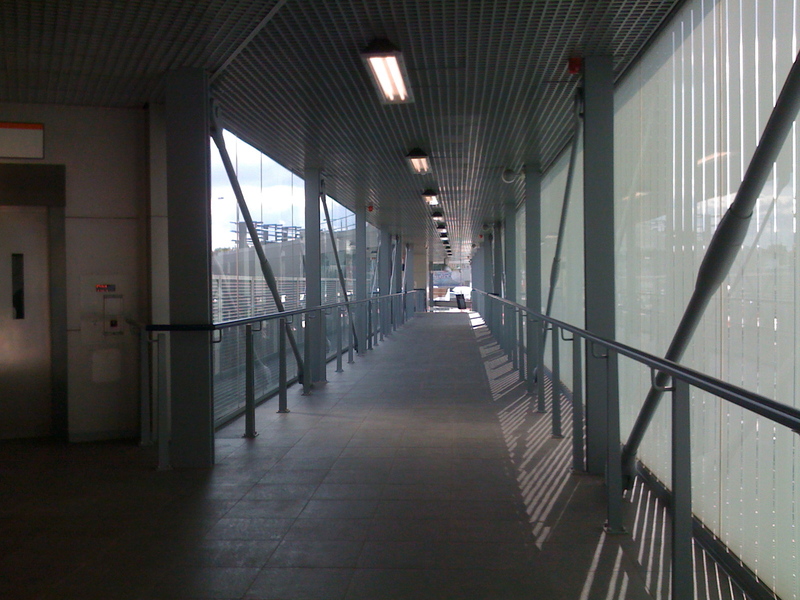 – Wood Lane – The station building and platforms look complete now. All signage has been placed up. The station will be open in October in which at the same time, Shepherd’s Bush (Hammersmith & City line) will be renamed Shepherd’s Bush Market. More details next month. These are the major updates for this month. Check On the Network next month for a lot more substantial news as the above open! Another blog entry again for today! I’ve just stumbled over some confusing details about the London Overground closures that took place from yesterday (1st September). The puzzling information is regarding Camden Road station! According to the closure leaflet (click here), Camden Road is served by London Overground trains between Watford Junction and Stratford via Camden Road (note this!). The leaflet states “Trains from Watford Junction/Willesden Junction will stop at all stations to South Hampstead, followed by Camden Road and then all stations to Stratford”. However, check the London Overground network map (click here) and you will notice that Camden Road is not served at all by Watford Junction and Stratford trains! Has the author made a mistake? 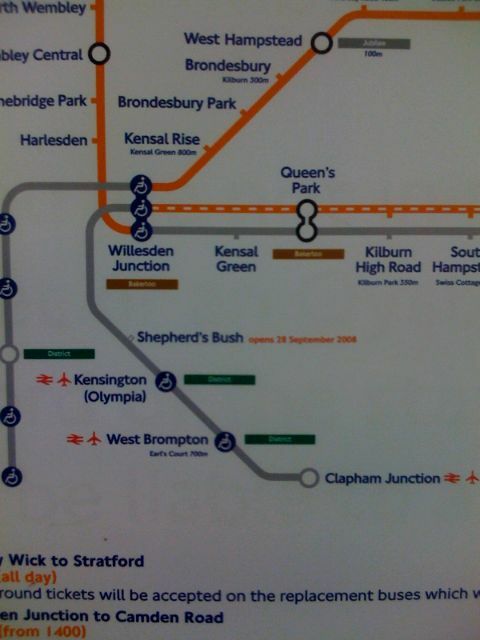 In addition, to an earlier blog entry I wrote, the maps appear to suggest that Shepherd’s Bush Overground station will open in ‘October 2008’ yet a weekend closure map suggested that the station would open on 28th September 2008. And where’s Imperial Wharf??? Mysteries that need answers! Let’s see if the authors of the maps make the corrections soon! In addition, shouldn’t the Tube Map receive and update on the closures? Shepherd’s Bush Overground will finally open! It seems a very long time now with the delay of the opening of Shepherd’s Bush Overground. This was because TfL were unhappy with the wall Northbound which made the platform narrow. But they were recently pushed back. However, today I was at Willesden Junction station and noticed on one of the station closures map that Shepherd’s Bush Overground station finally has an opening date! 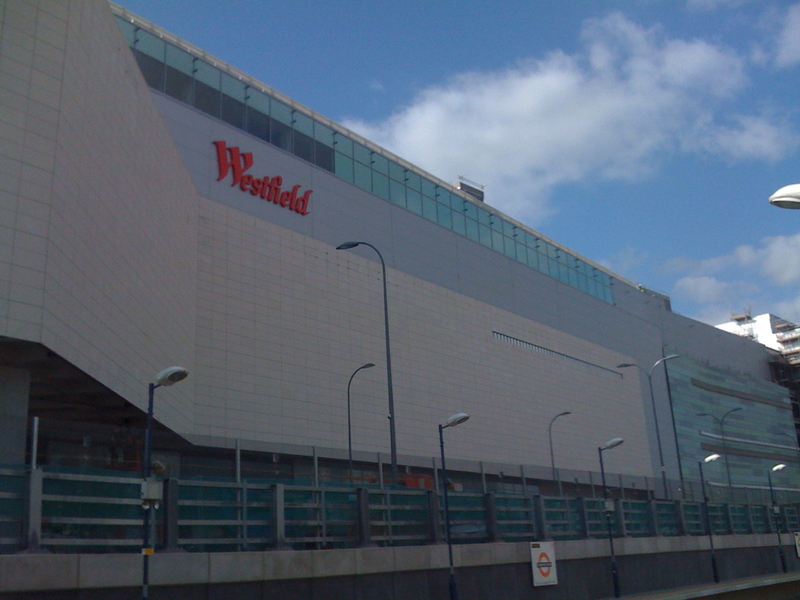 It will open on 28th September 2008. That will mean that it will open before Shepherd’s Bush Central line station which opens in mid October. Check the photo below for confirmation! I will probably pay a visit around that time, it should be good! Closures to London Overground coming! You will probably be aware of the London Overground closures coming from Monday 1st September 2008. I wrote an earlier blog sometime ago about the closures in detail. Click here for full details. Gospel Oak – Willesden Junction: 1st September to 17th November 2008. 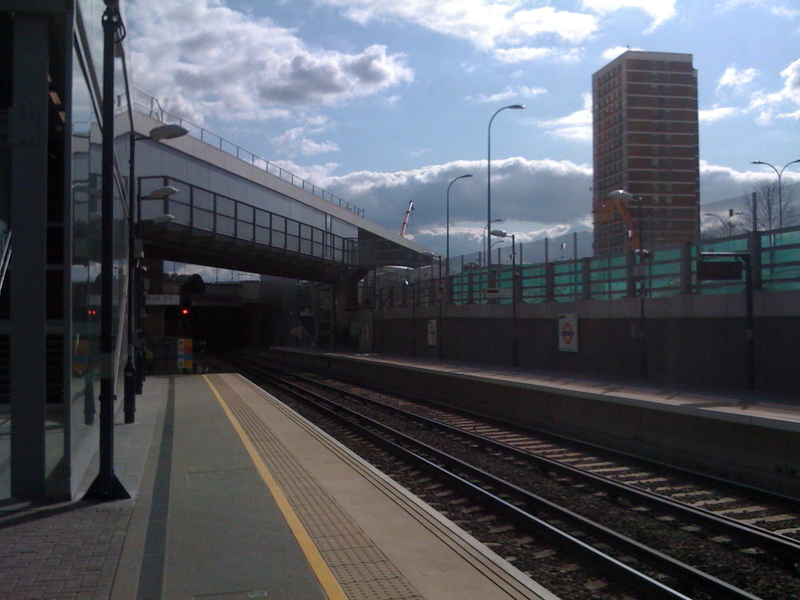 Gospel Oak – Barking line: 1st September to 29th September 2008. Gospel Oak – Camden Road: 22nd September to 29th September 2008. Replacement bus services are planned during the closure. 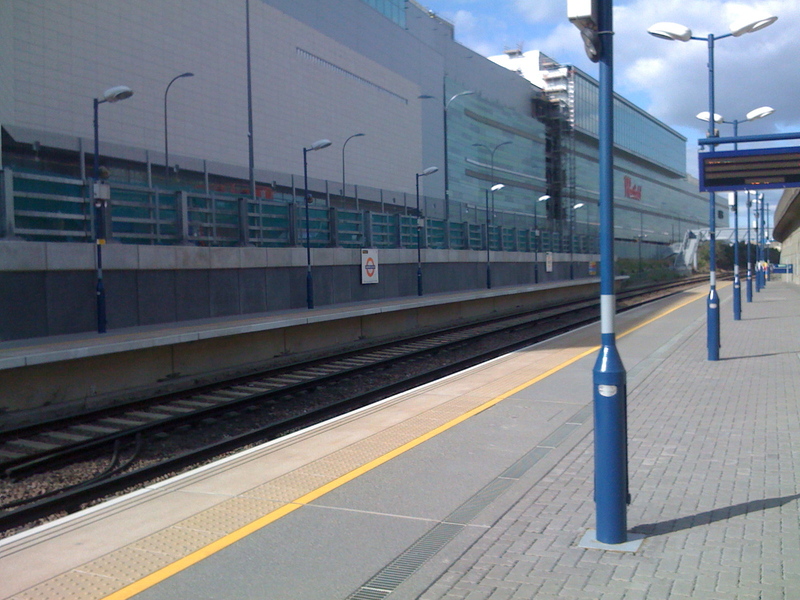 Although the Watford Junction – Euston line is unaffected, the route will be altered so that Watford Junction trains will go towards Stratford via Primrose Hill on Mondays – Saturdays. The normal route will run only on Sundays. The West London line runs as normal (Willesden Junction to Clapham Junction) and there is service between Willesden Junction and Richmond. So what is going on? Well as well as track replacement work, there will be replacing bridges (mainly on the Gospel Oak to Barking line) and the widening of a tunnel (that being the Hampstead Heath Tunnel). What do you think of these closures? What alternatives are you going to take? Let me know!